Dark Horse Comics wants to make a big splash at Toy Fair 2015. What better way than by presenting a new bust of Criminal Macabre character Cal McDonald. Cal investigates crimes that others won’t touch. The cops (and nice people generally) avoid Cal. But an array of otherworldly types won’t leave him alone. The bust, sculpted by horror specialist William Paquet, shows Cal with the tools of his trade. The base is an artistic swirl of demons emerging from the ether. The bust measures a big 14 inches tall. Packaged in a full-color box, with a certificate of authenticity signed by both Niles and Paquet, this hand-painted, numbered piece is limited to only 375 copies. It will be available August 2015 for $149.99. The prototype will be revealed at the Dark Horse booth, #4837, at Toy Fair 2015, held February 14–17 at Jacob Javits Center in New York City. 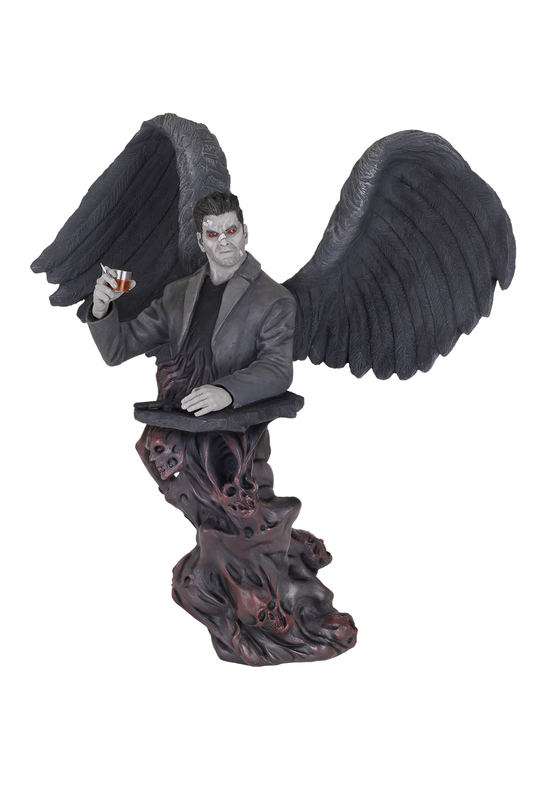 Additionally, Dark Horse will produce a special rare winged Cal McDonald variant bust. Dark Horse has produced an ultrarare variant for the serious collector. This variant will be limited to 75 pieces. The wingspan is a giant 13 inches across. Packaged in a special white box with a color sticker graphic and surprise extras, this piece is subject to allocation. Available July 2015 for $225.